Capture the spirit of the high seas with a masterfully handcrafted model of the Bluenose II, a storied fishing schooner that is depicted on Canadian dimes. Master craftsmen using historical photographs, drawings or original plans meticulously handcraft these highly detailed wood models from scratch. They are built to scale with high-grade wood such as: western red cedar, rosewood, and mahogany. They are 100% hand built individually using plank-on-frame construction method and are similar to the building of actual ships. Each model requires hundreds of hours to finish and must go through a demanding quality control process before leaving the workshop. 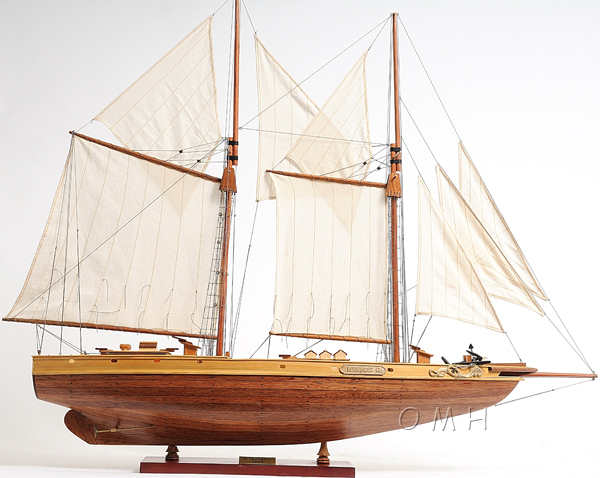 This is beautiful Bluenose II natural wood version. It has wooden booms connected to the main and foremast. All the sails are rigged beautifully together to make up the beautiful boat. On the deck, there are authentic hand-built lifeboats with ribs and planks. The bowsprit goes through the gunwale that is hold securely to the bow by riggings. Cabins and companionways are located on the wooden deck. You will find metal anchors near the gunwale inside the two golden ornament piece of the Bluenose. 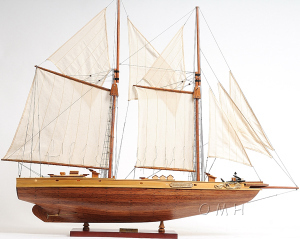 This model is truly a remarkable representation of the Bluenose II. This model comes standard with a solid wood base and brass nameplate. The masts and sails are folded down for easy shipping. Assembly takes about 30 minutes or more depending on skill. Itll make a perfect gift for home or office decorator, boat enthusiast or passionate collector.